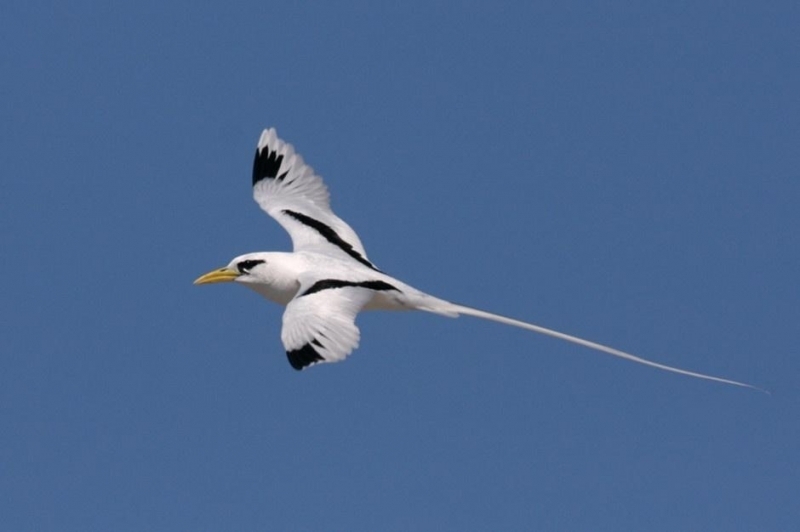 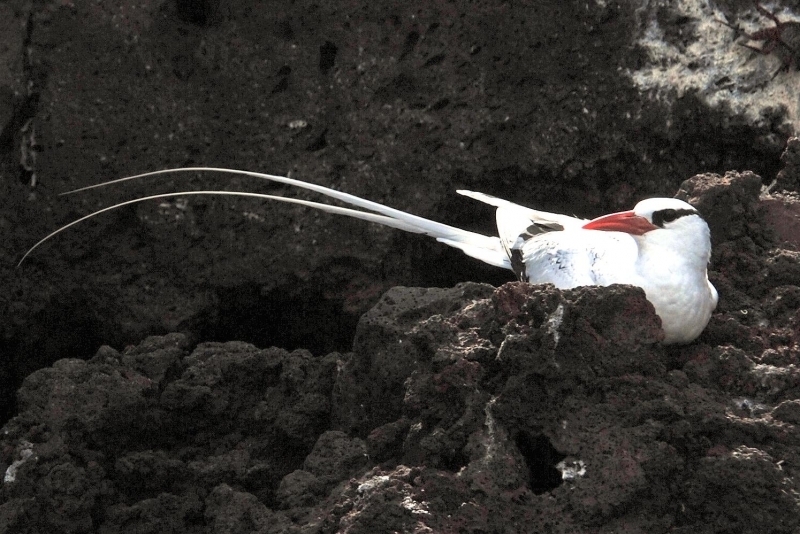 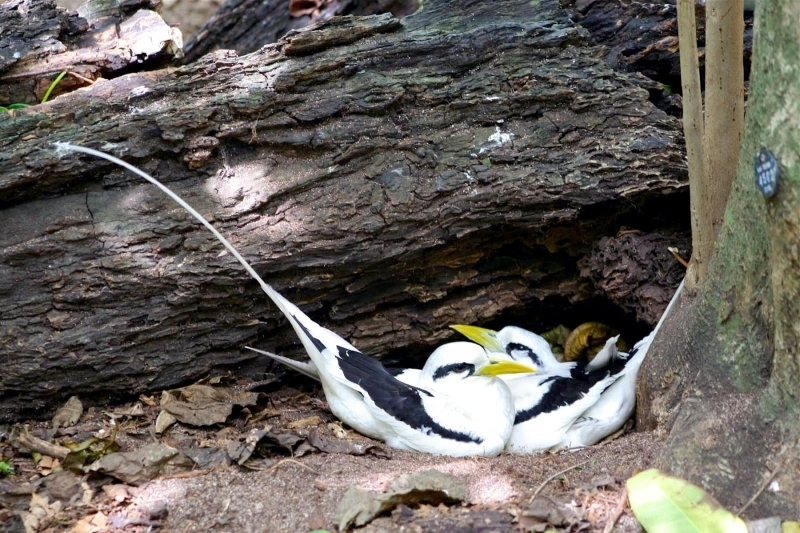 The White-tailed Tropicbird is the smallest of the tropicbirds, a group of elegant seabirds renowned for their greatly elongated tail streamers that extend from the wedge-shaped tail. 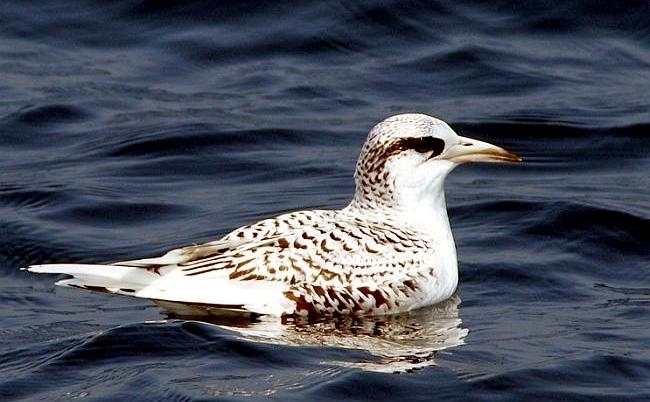 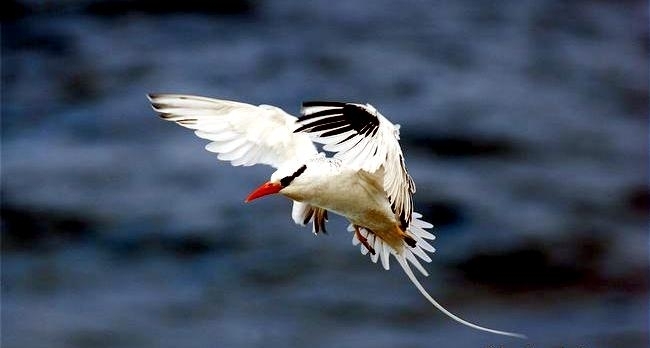 Adult birds have mostly white plumage with long, white tail streamers. 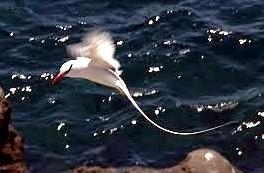 Tail feathers are visible while the bird is in flight. 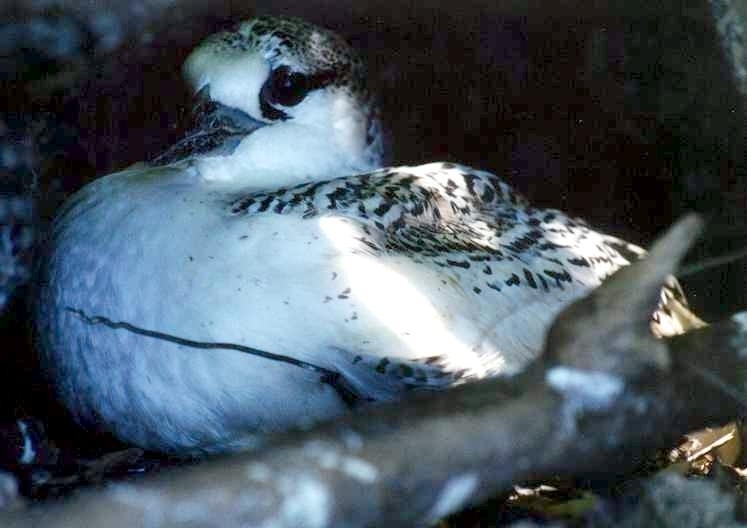 Black eye-stripe from gape curving toward and passing through eye. 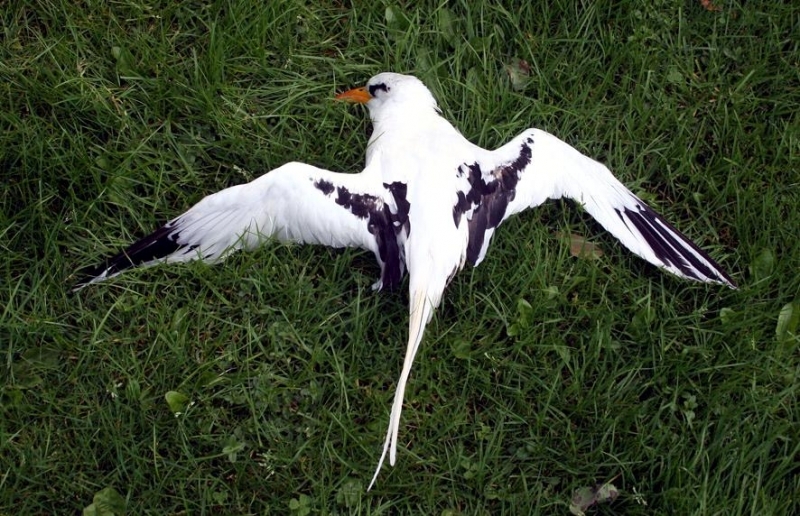 Diagonal black stripe across upper wings. 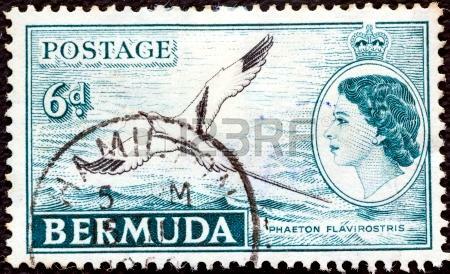 Yellowish to orange bill. 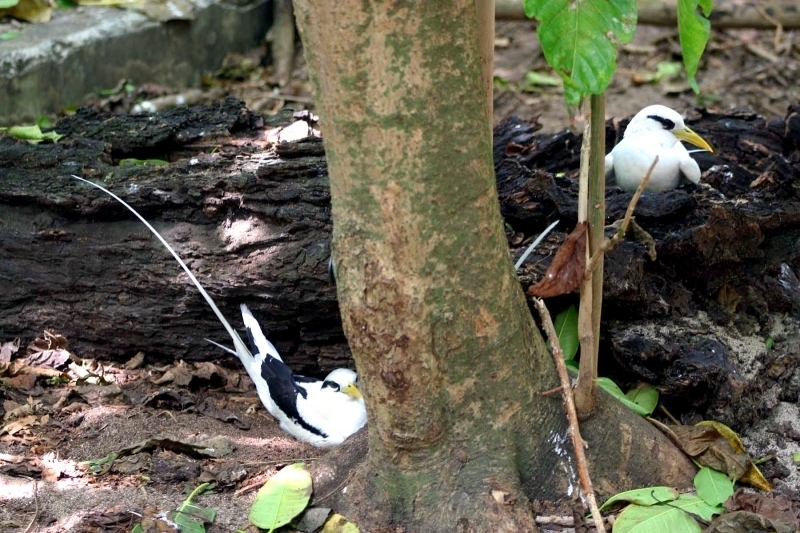 Legs & feet are yellowish with black webs. 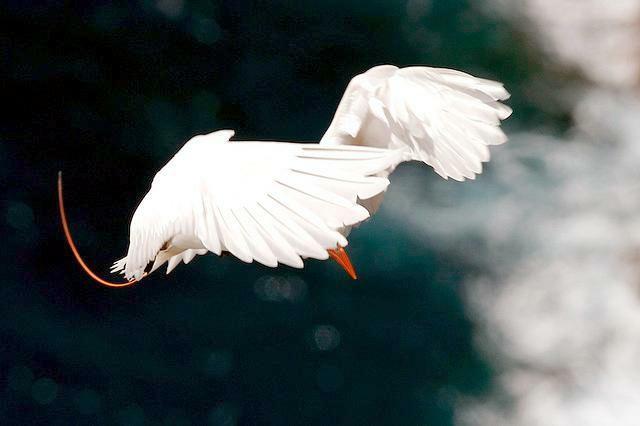 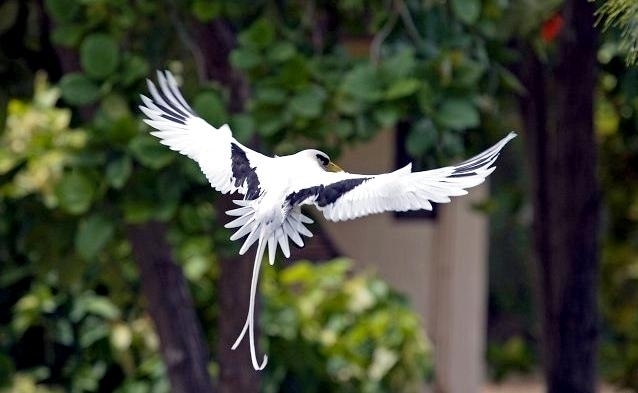 In the United States, this beautiful bird is seen mostly in southern Florida. 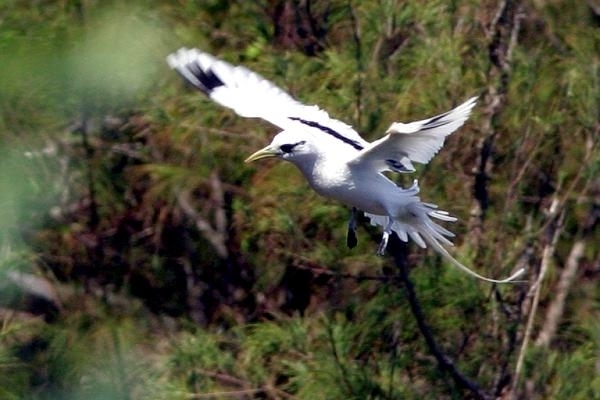 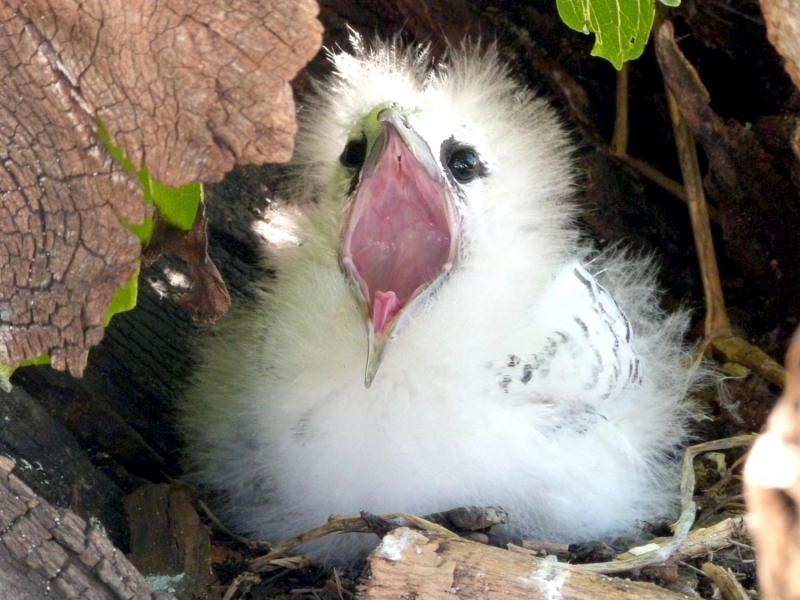 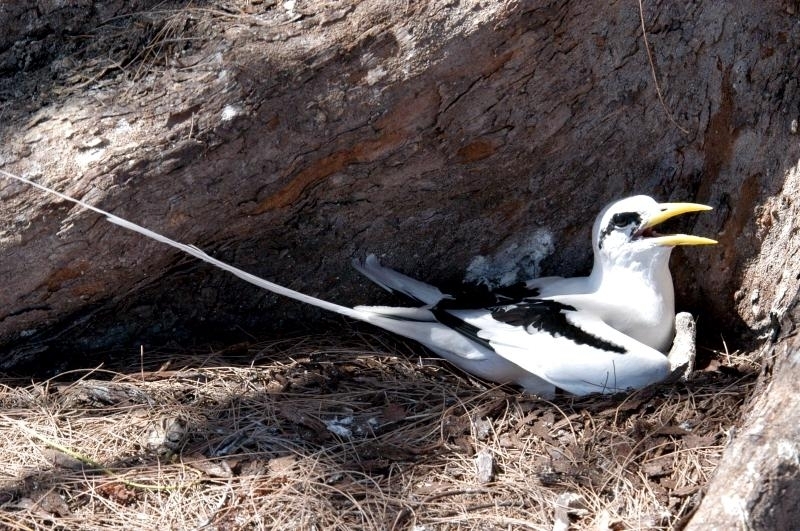 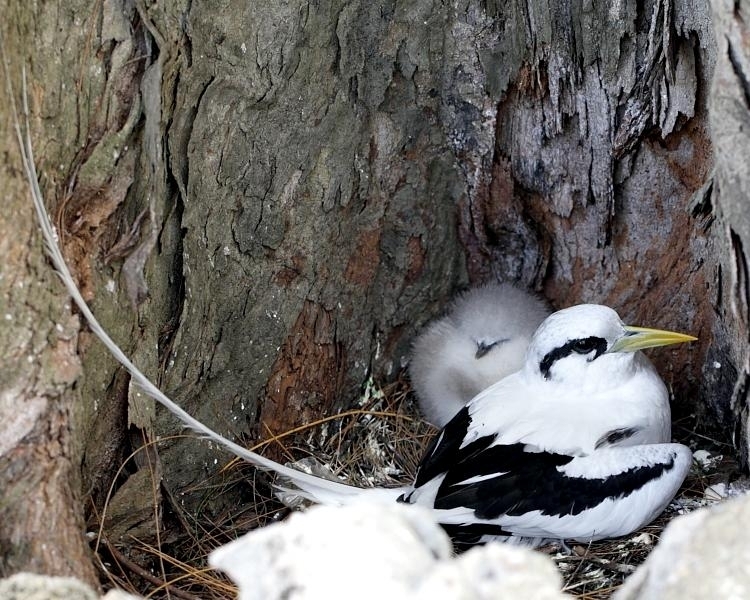 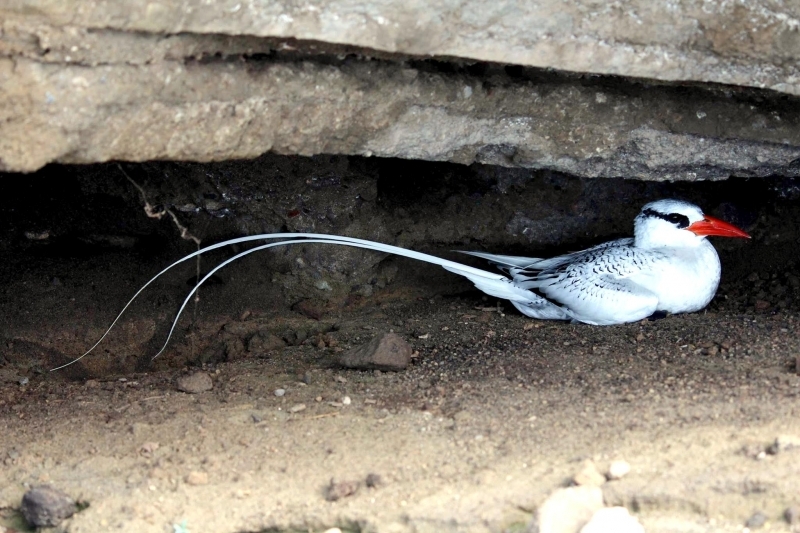 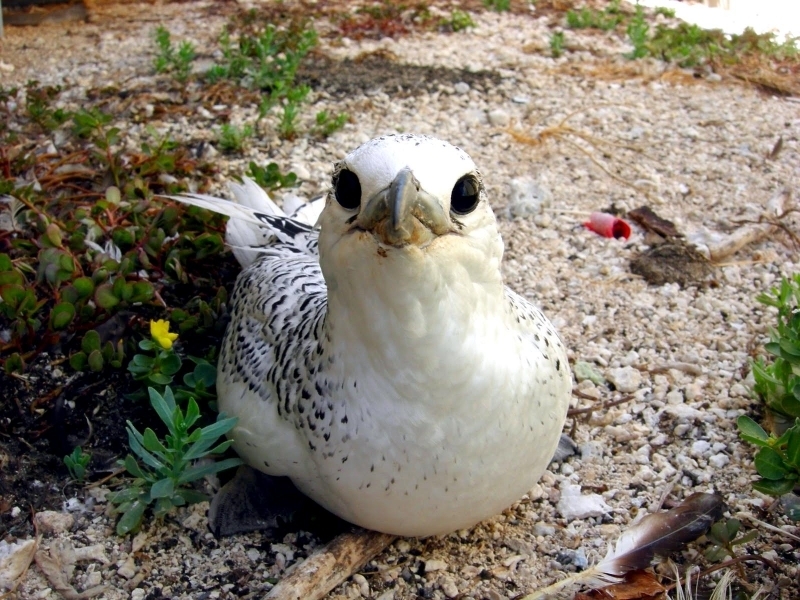 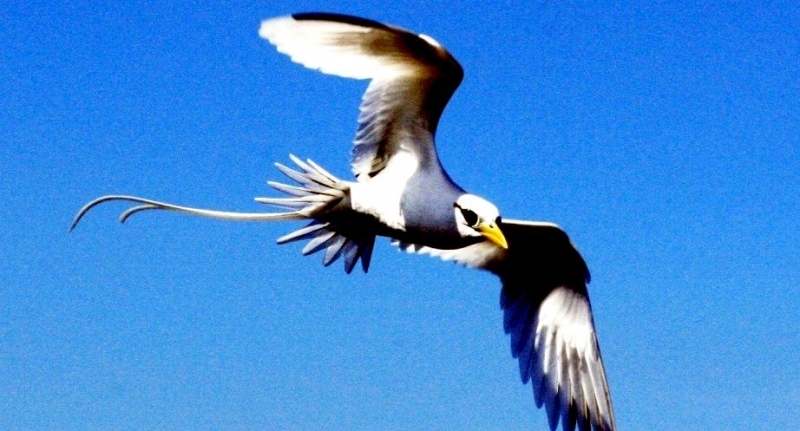 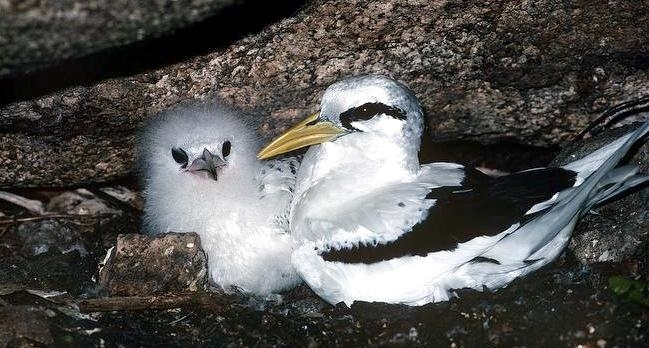 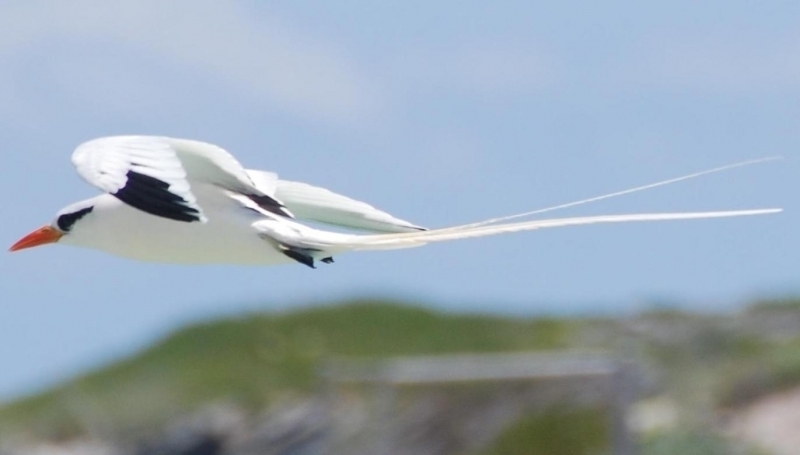 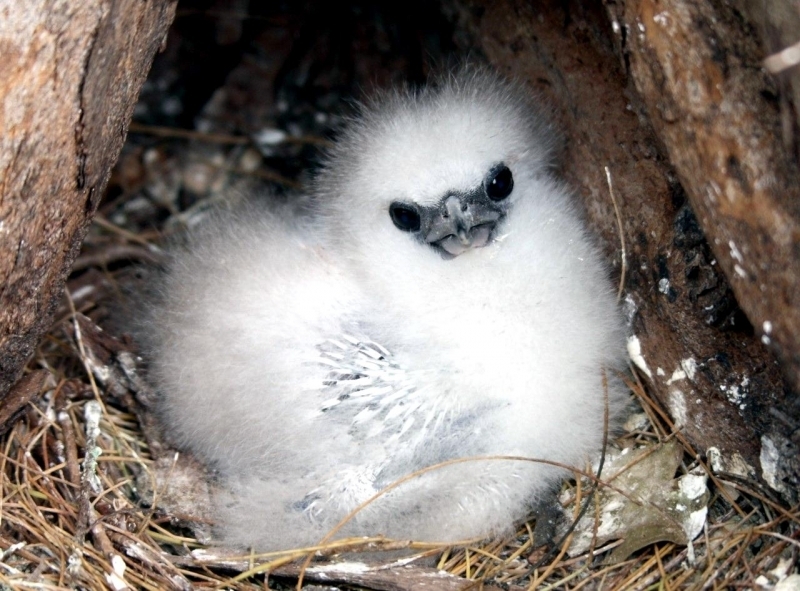 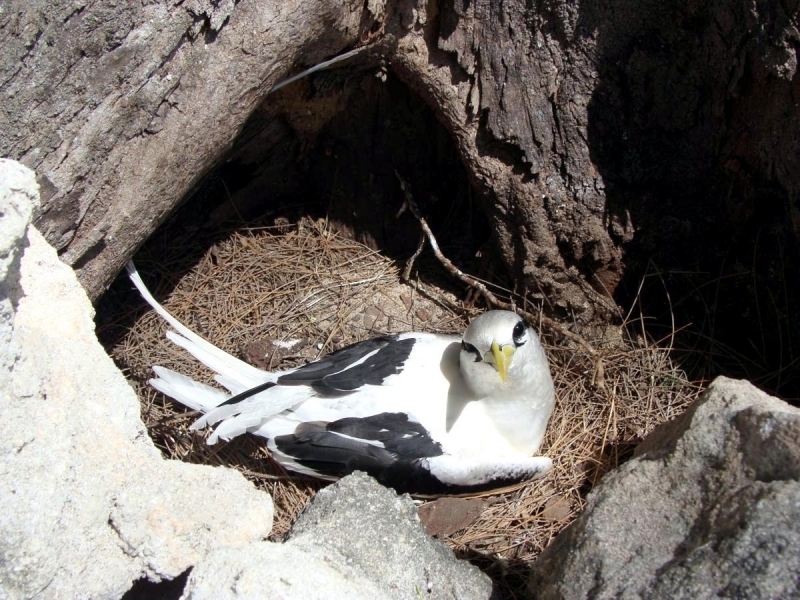 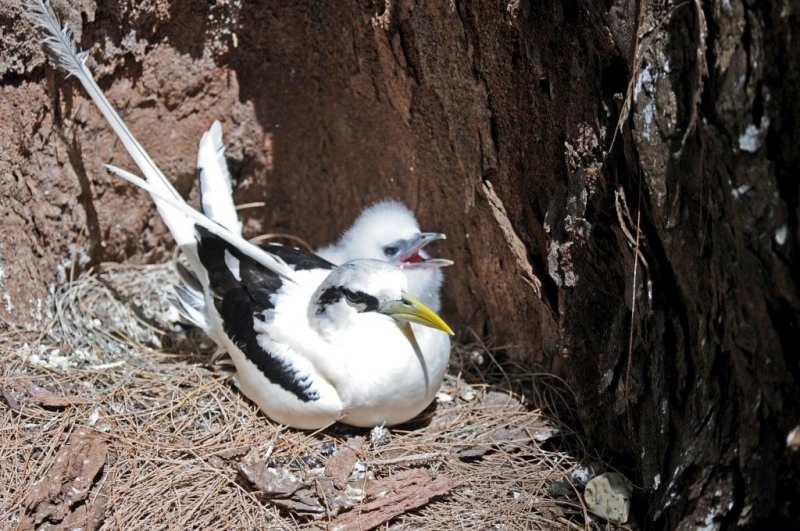 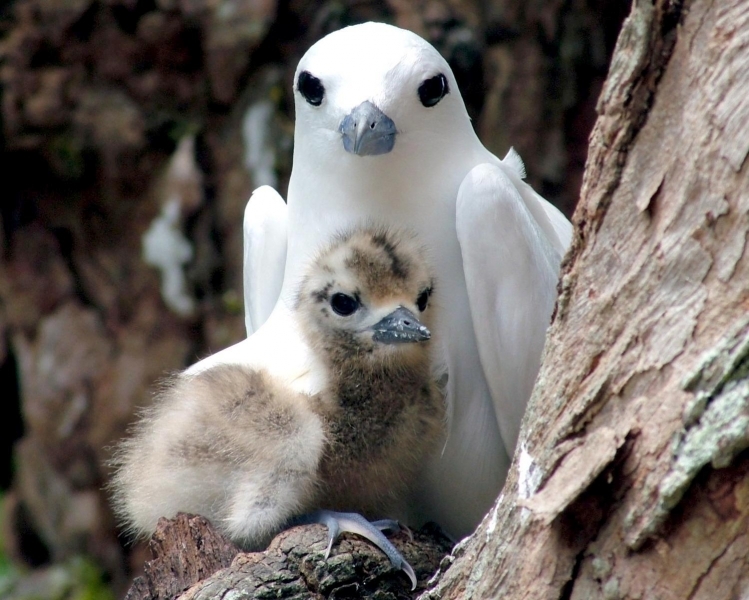 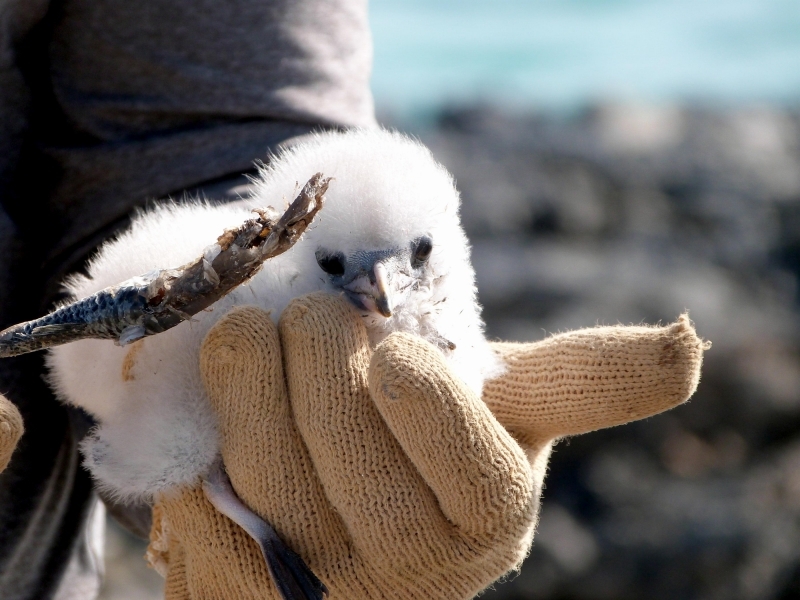 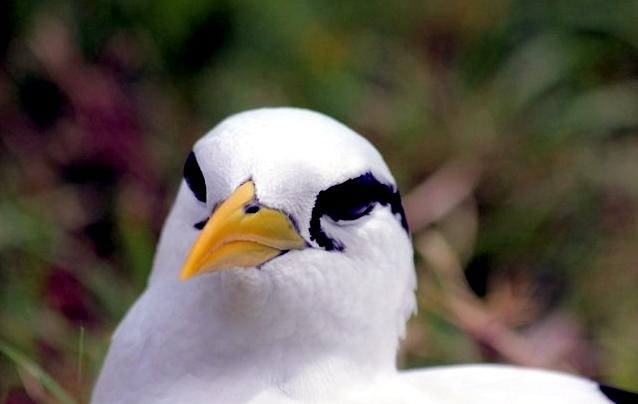 The White-tailed Tropicbird is the national bird of Bermuda where the “Longtail” as it is called, is familiar to all and is given complete government protection. 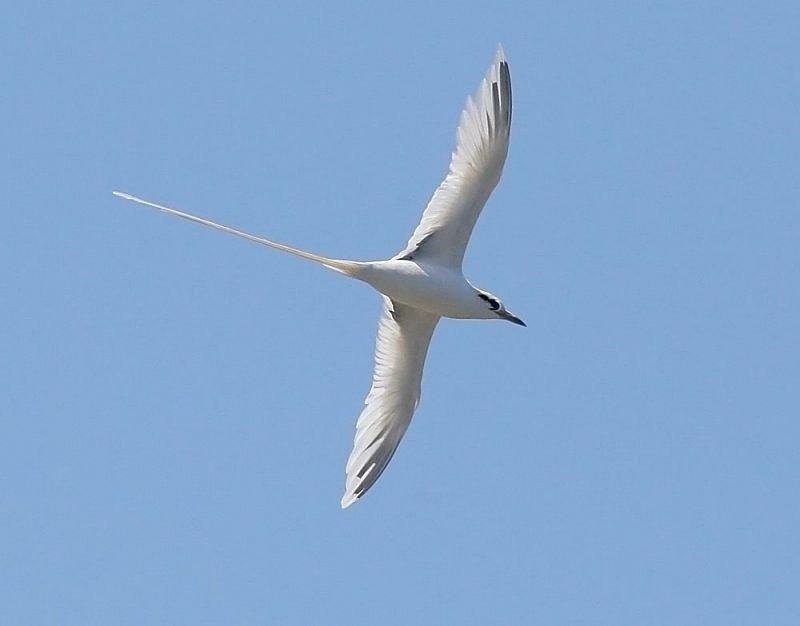 White-tailed Tropicbirds are remarkable for being able to remain at sea for indefinite periods and can sustain long periods of flight. 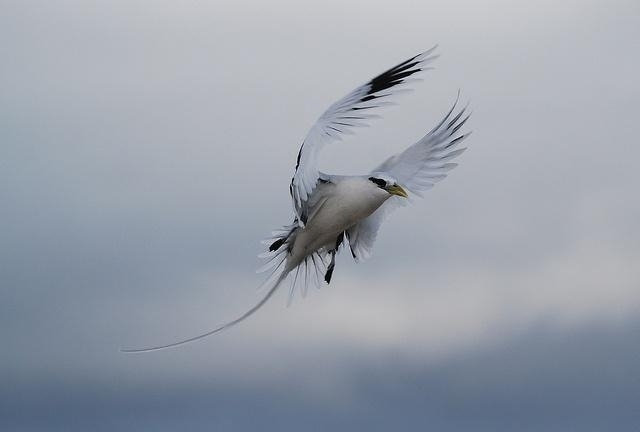 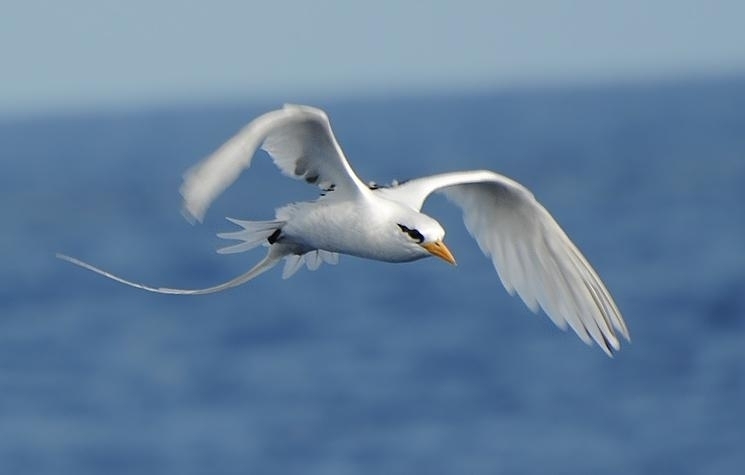 While resting at sea, White-tailed Tropicbirds float on the sea surface, due to their fully waterproof plumage and will take to the air again after powerful beats of the wings and thrusts of the fully-webbed feet. 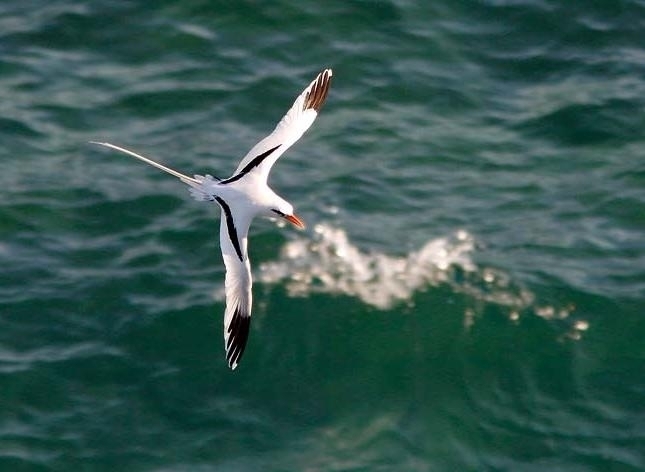 Once its prey is targeted, it hovers briefly with the head and bill pointed downwards, before making a rapid, vertical, spiraling plunge. 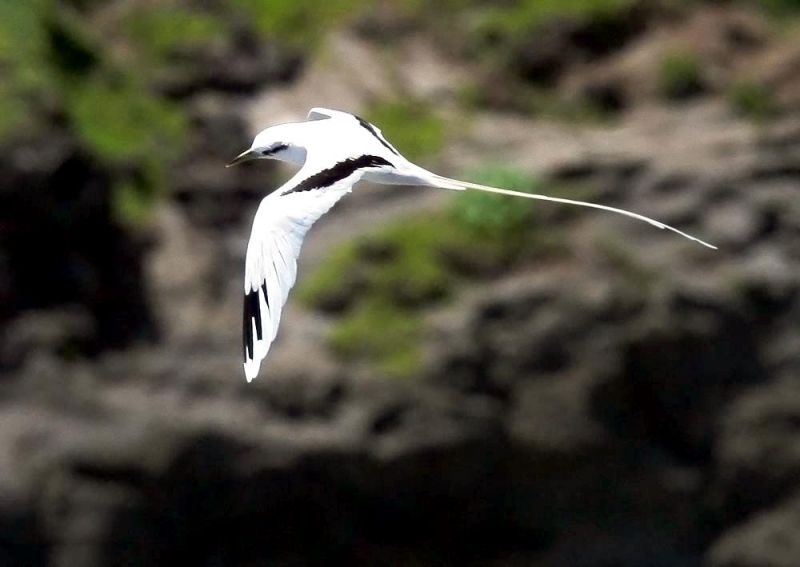 With folded wings, White-tailed Tropicbirds hit the water and completely submerge to seize and swallow prey before flight. 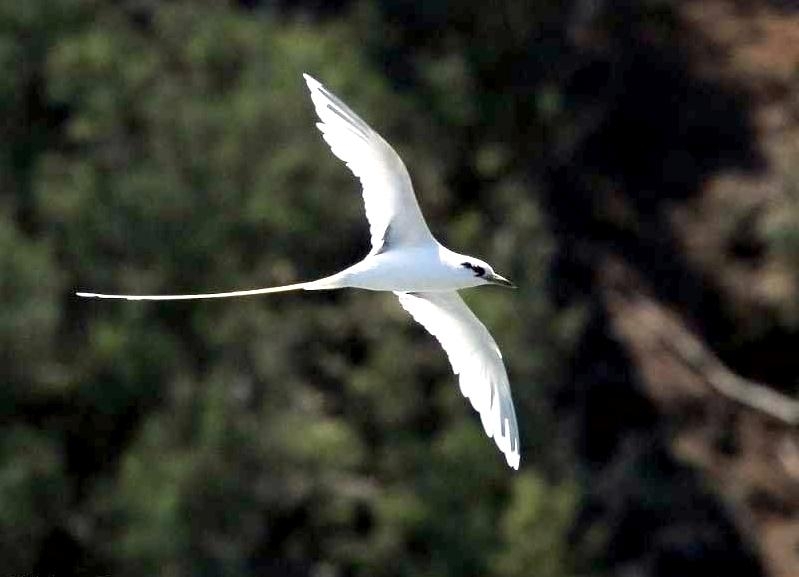 The White-tailed Tropicbird can be found across much of the tropical oceans including the southern Indian Ocean, western & central Pacific Ocean and south Atlantic Ocean. 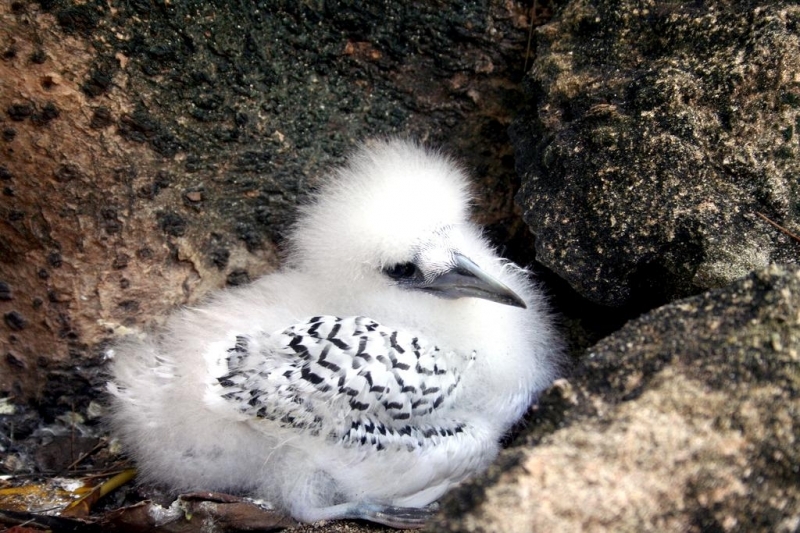 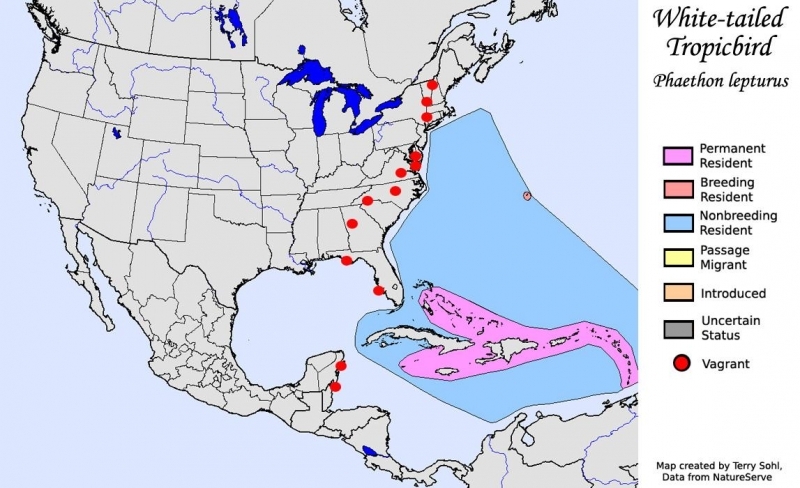 Breeding colonies are also found throughout the Caribbean region. 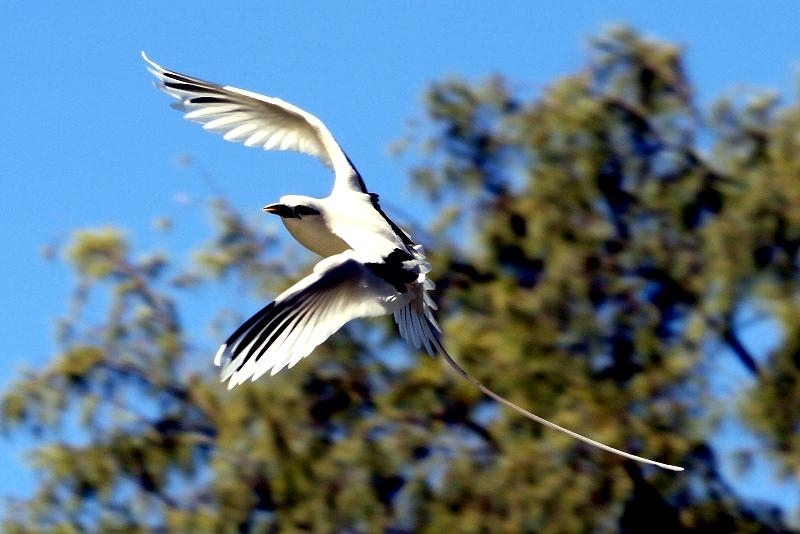 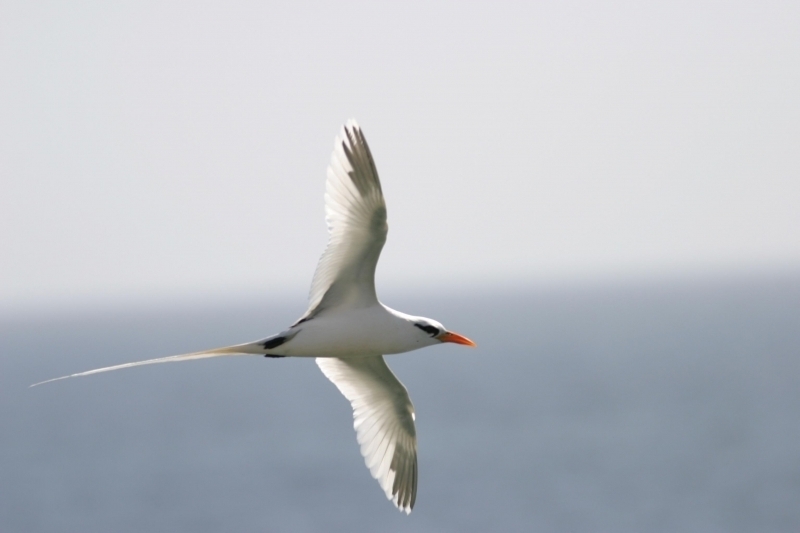 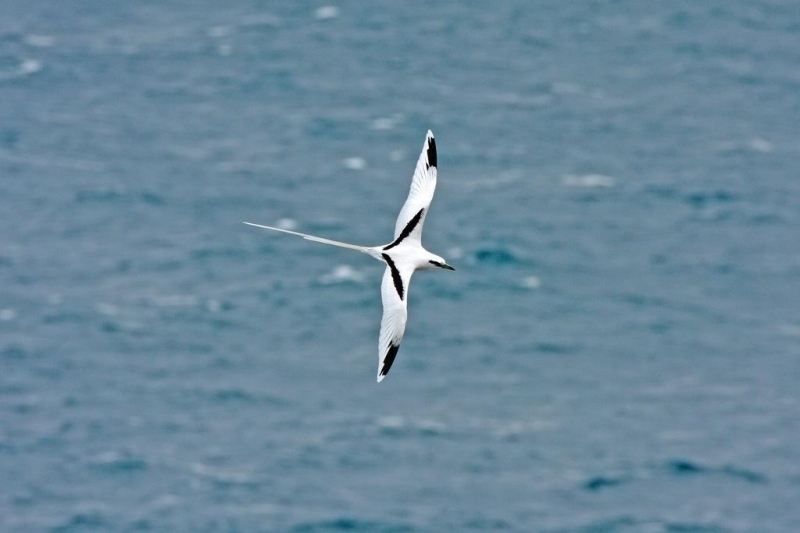 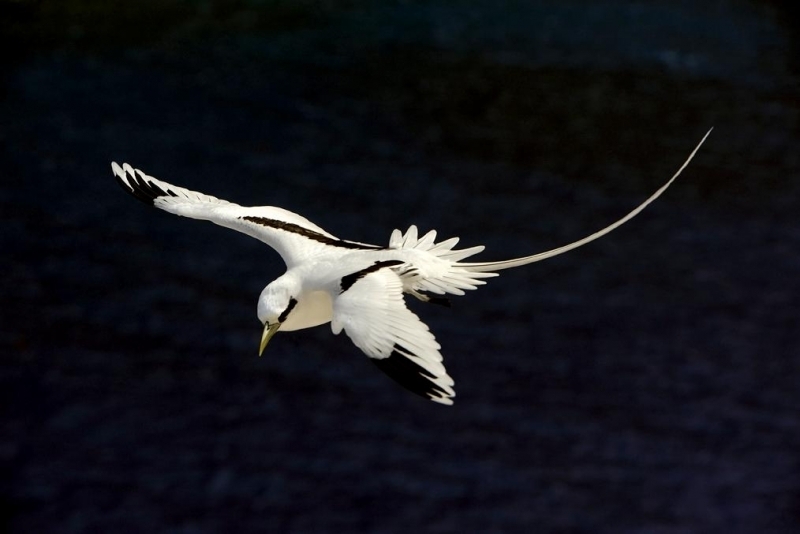 The White-tailed Tropicbird can be found over pelagic waters and the coast of tropical & subtropical seas. 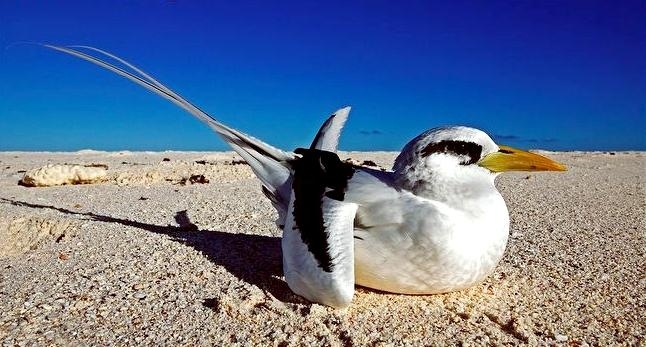 In the water, this seabird can make rapid movements, with quick turns and twists, all the while using the half-bent wings to control its body and its prey is captured in its serrated beak. 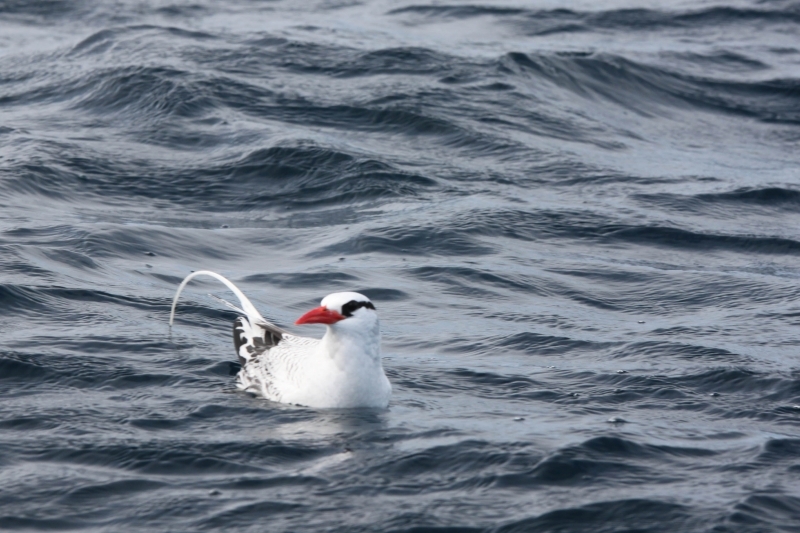 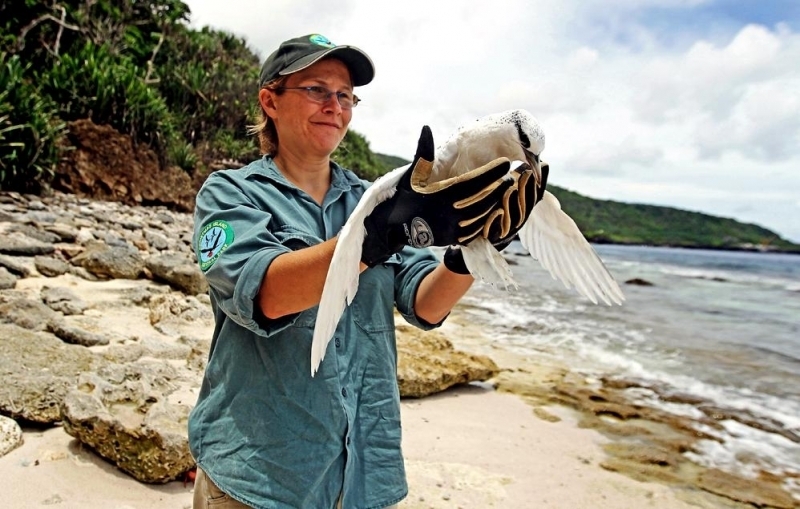 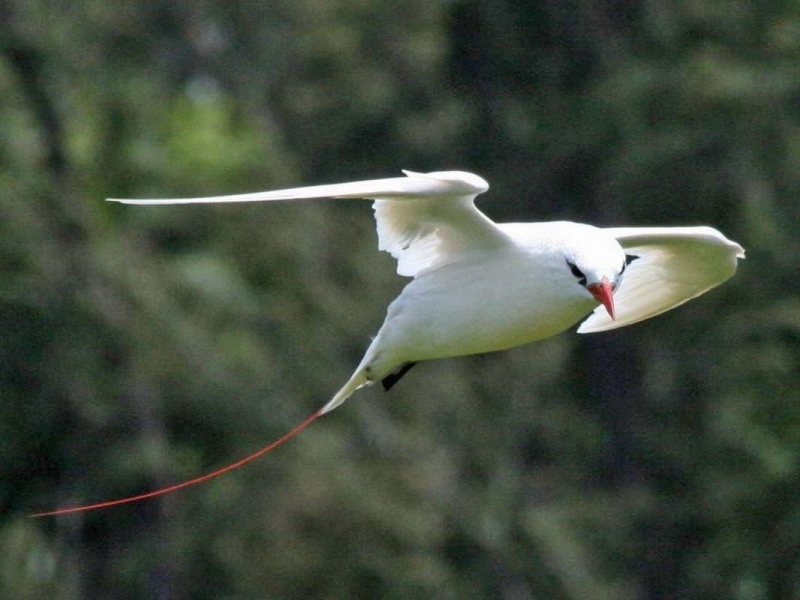 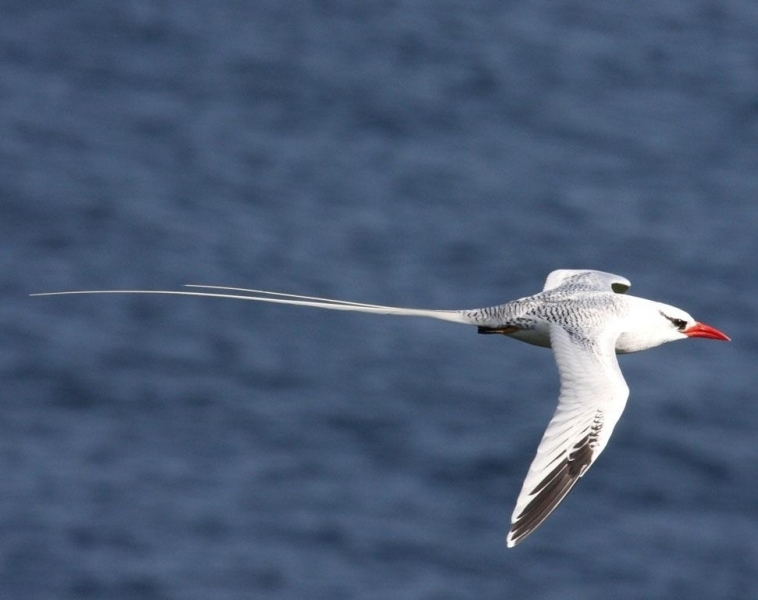 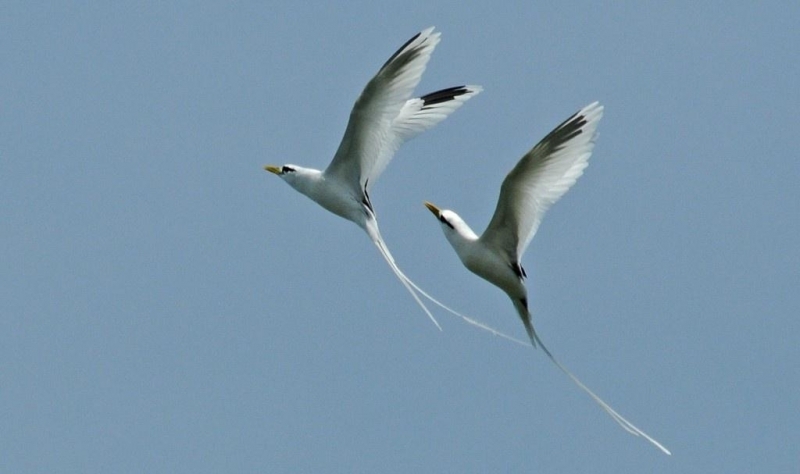 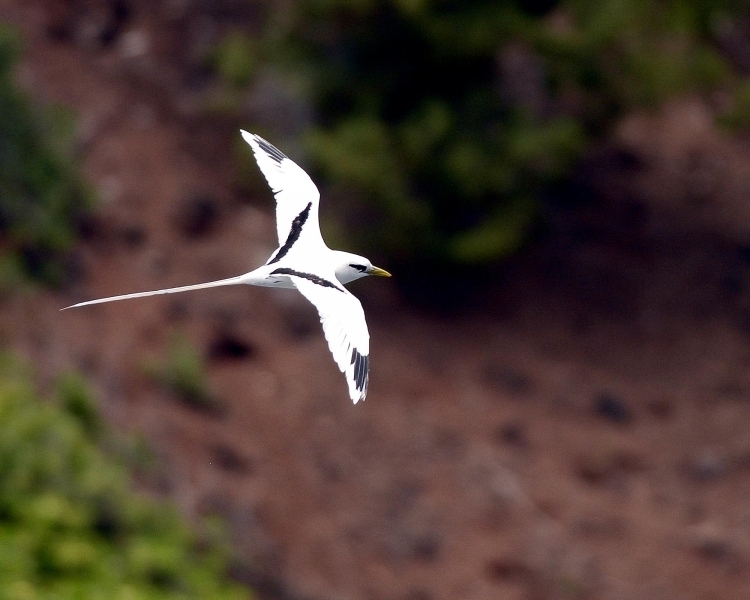 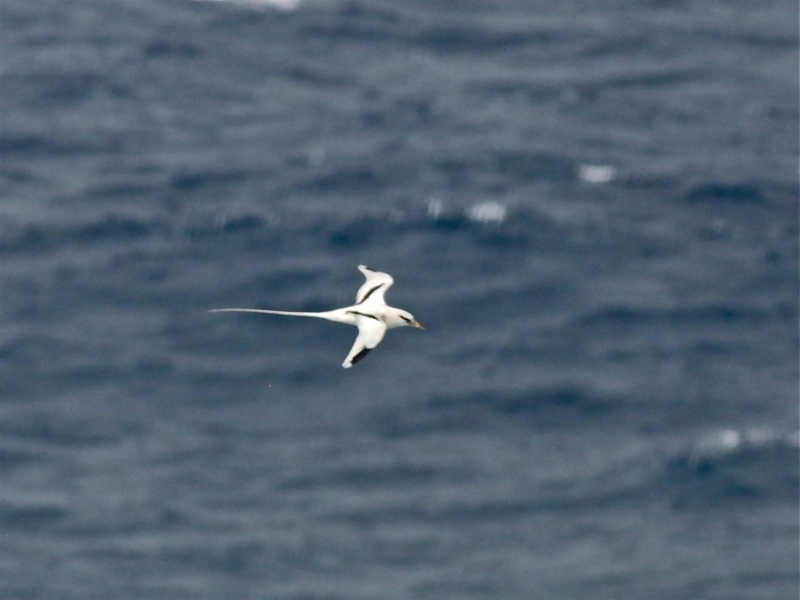 On land however, the White-tailed Tropicbird is less impressive and its movement is extremely awkward. 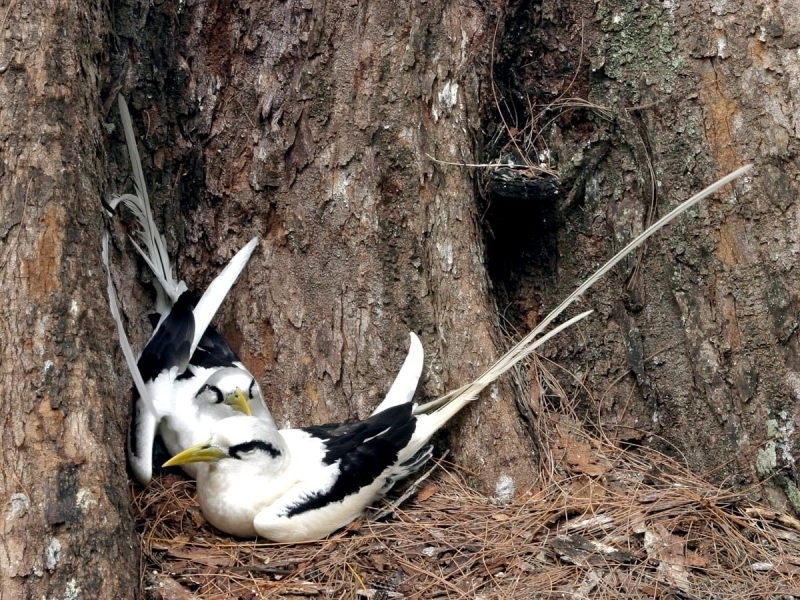 The bird lies on its belly and stabs its bill into the ground, pulling itself forward in an ungainly shuffle. 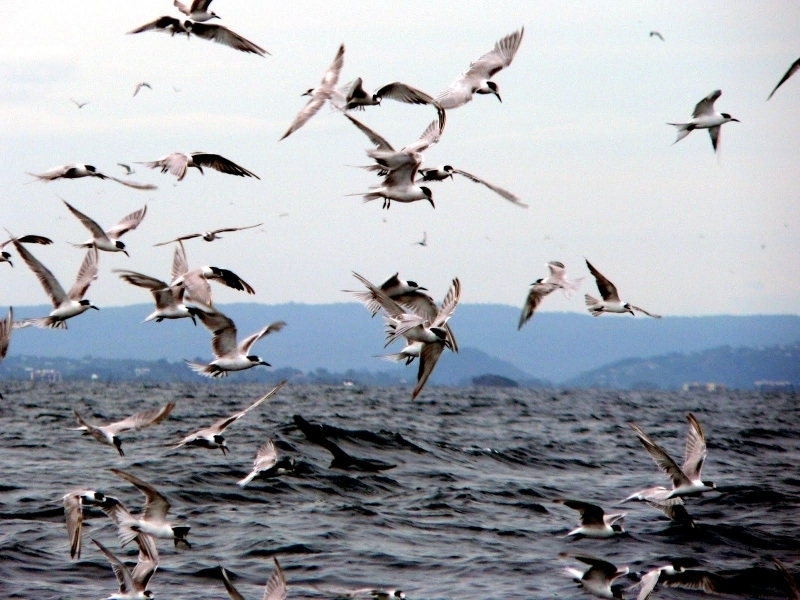 It feeds on small fish especially flying fish, squid and some crustaceans especially crabs. 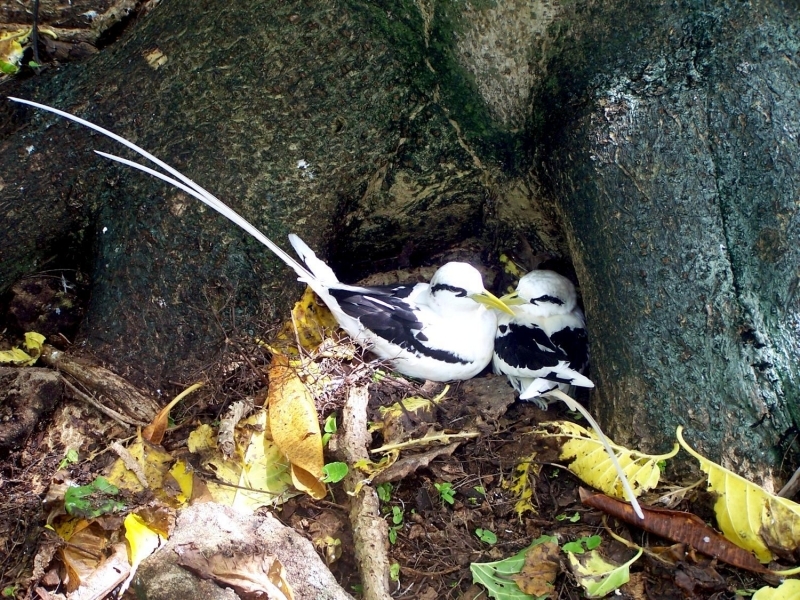 Its diet varies locally, for example taking mostly fish in the Seychelles. 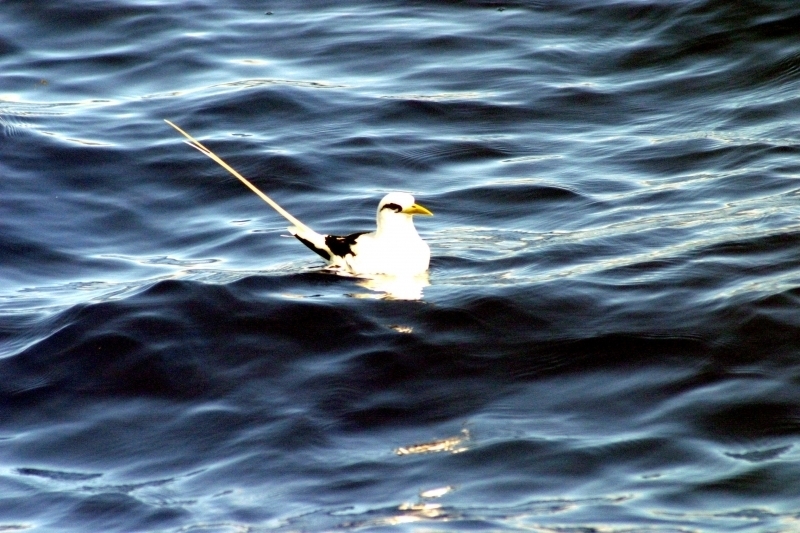 Most prey is caught by plunge-diving but flying fish can be taken on the wing. 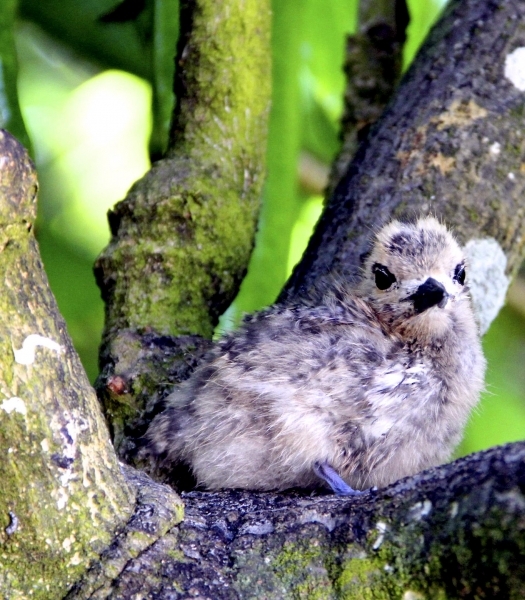 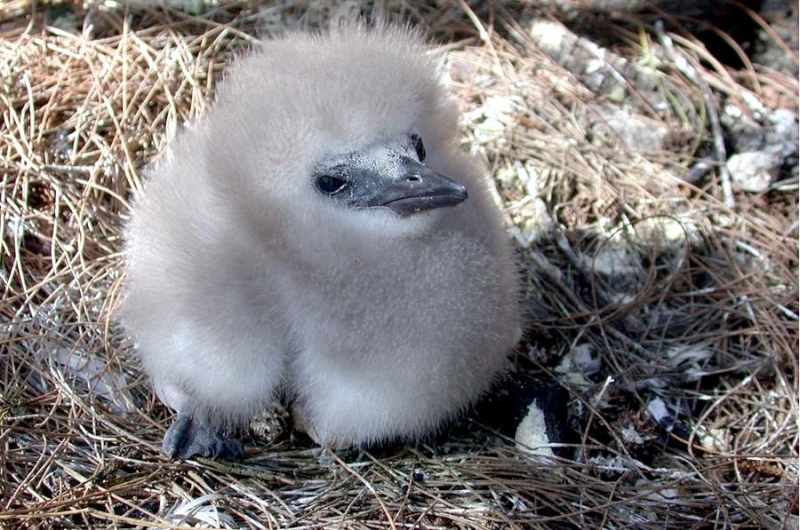 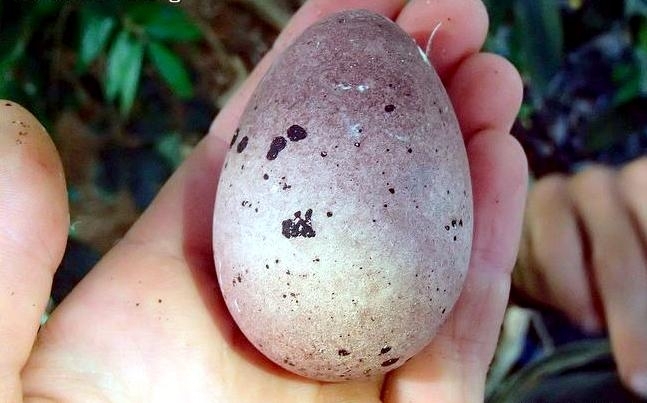 The female lays 1 large egg, ranging in color from reddish brown to purplish black, directly on the ground in the shade of vegetation, a log or rocks. 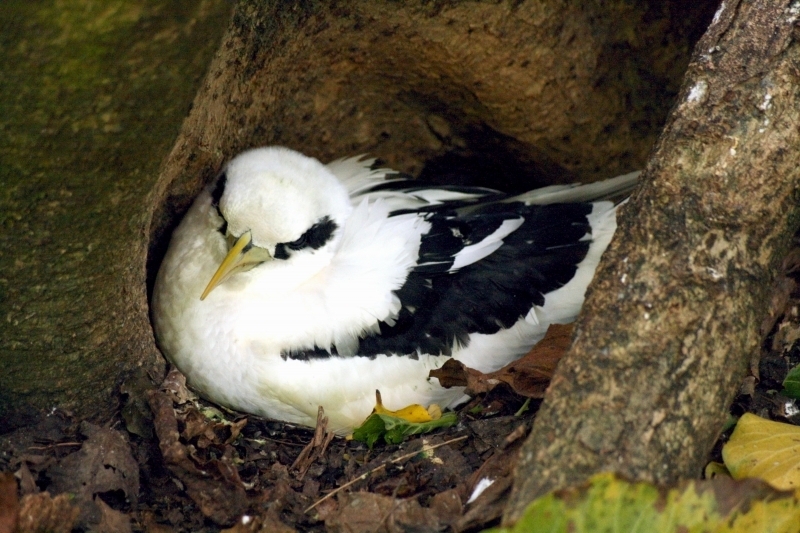 Re-laying can occur if the first egg is lost or infertile. 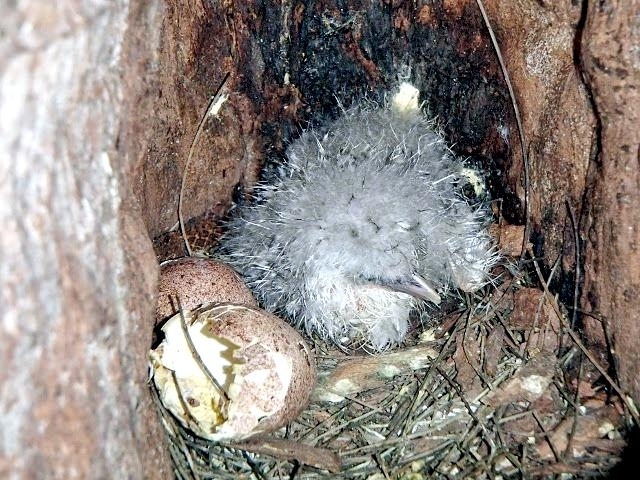 Incubation period varies from 39-51 days. 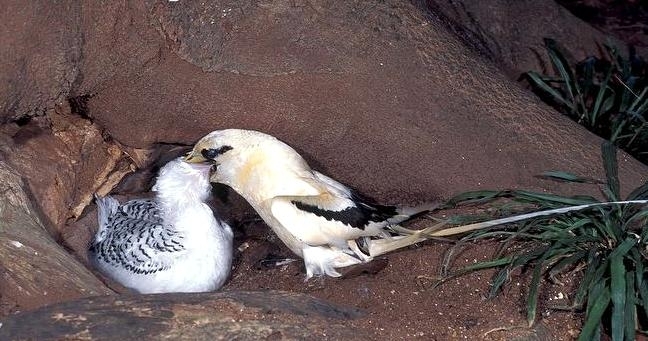 Both parents incubate the egg. 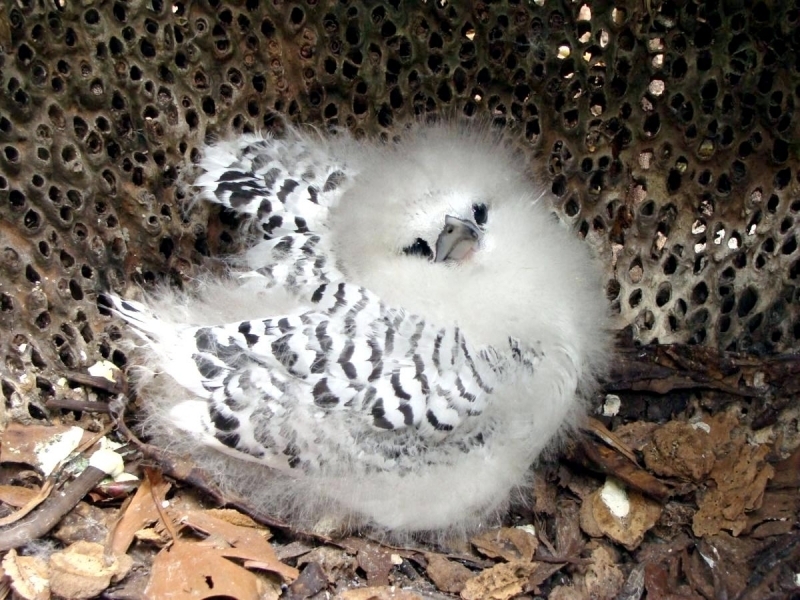 Average incubation shift lengths range from 8-9 days in some colonies. 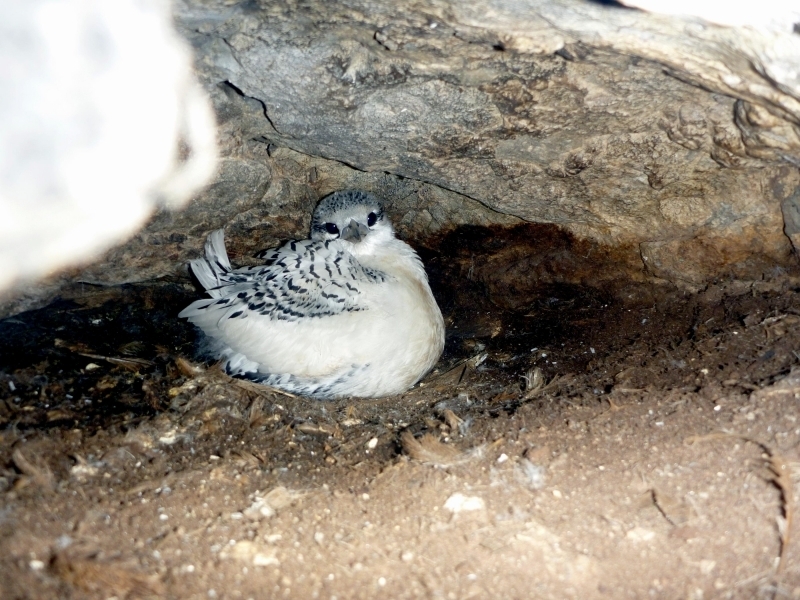 Breeding is seasonal in places but elsewhere can be more or less continuous. 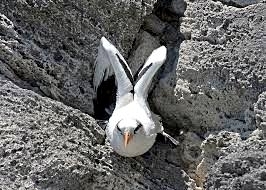 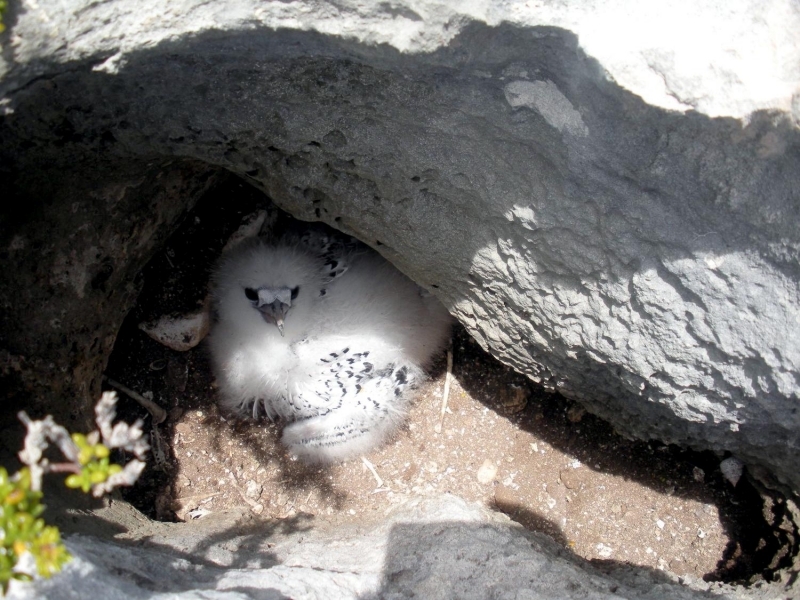 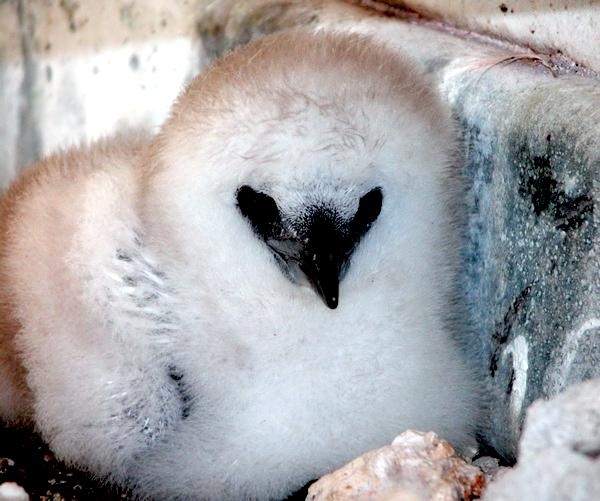 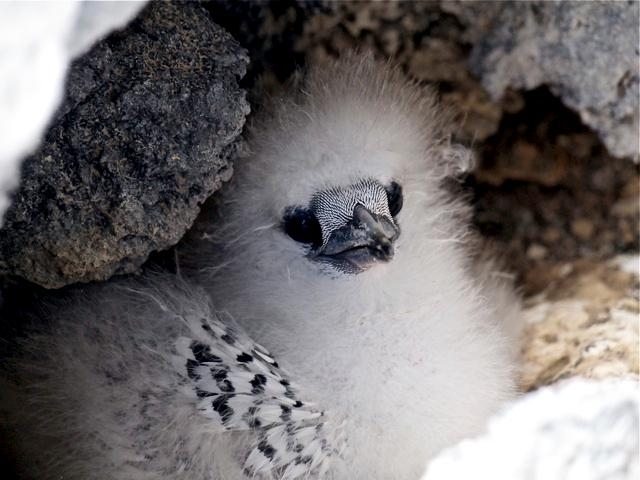 It is loosely colonial, nesting in rocky crevices or sheltered scrape on the ground on small-remote islands preferring inaccessible spots on cliffs where take-off is relatively easy. 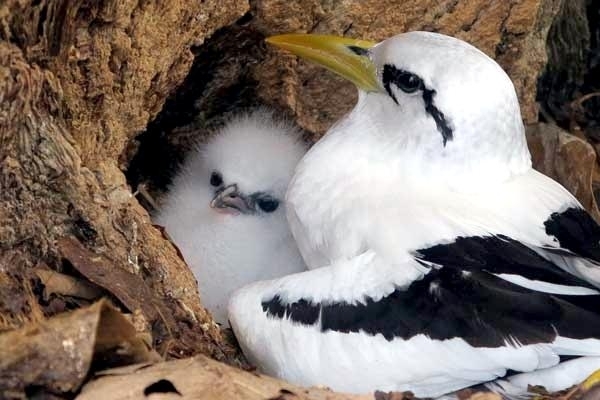 It is resident & dispersive, with both adults and juveniles wandering extensively throughout its selected home region with an average life-span is 16-years.